Nineties kids, rejoice: The drought has ended and the real Nickelodeon is back. 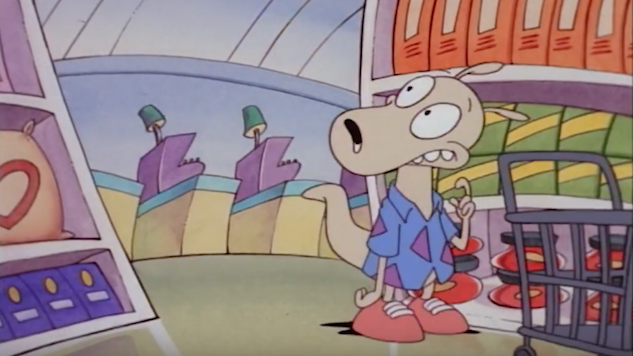 Nickelodeon has teamed with fandom-focused platform VRV to launch NickSplat—the late-night programming block specializing in ‘90s nostalgia—as a streaming channel on the platform. For $6 a month, the service allows you to revisit TV’s glory days, from carefree NickToons to simultaneously angsty and nonsensical live-action hits and children’s game shows (which never should have left in the first place). This is not a drill. We’re talking shows like Clarissa Explains It All, Doug, Are You Afraid of the Dark?, Legends of the Hidden Temple, The Wild Thornberrys and so many more. You may have noticed that there are major holes in the channel’s current lineup, but have no fear: The channel’s curated programming is expected to rotate and shows are expected to be added as the lineup evolves. So, prepare your scrunchies, flannel and green slime, and settle in for the ultimate throwback TV binge. Check out the channel’s teaser trailer below and find its current episode listing further down. You can explore VRV for yourself here.